As a coach, teaching a lifter to perform potentially complex, multi-joint exercises correctly and consistently is a skill. Although in barbell training, the core exercises are natural expressions of loaded human movement, to understand, analyze, and influence the lifter’s movements the coach must have a firm grasp of the model for each exercise, comprising its mechanical (movement against a loaded barbell), anatomical (the generation and transmission of force in the musculoskeletal system), and physiological (the resulting adaptations of the exercise) aspects. 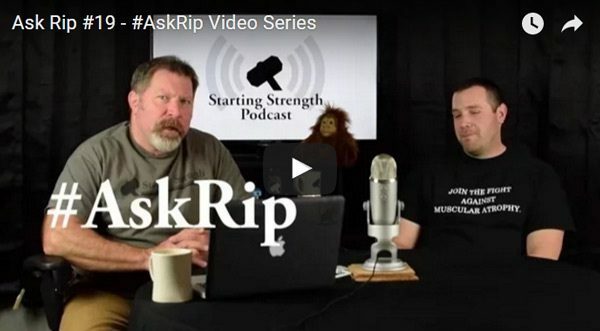 The coach’s role is to help the lifter translate the model for each lift into movement. 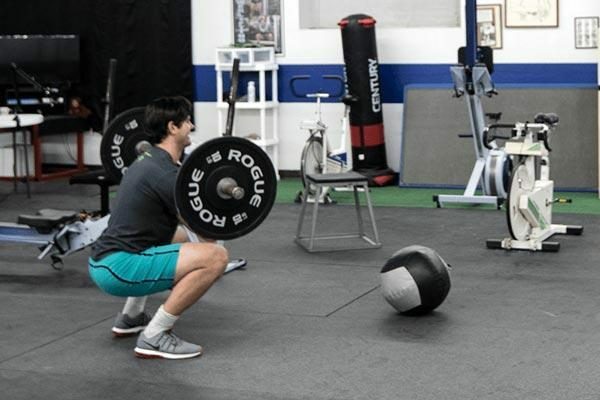 Starting Strength: Basic Barbell Training puts forth, in detail, the model for the core lifts as well as instructions for translating the models into loaded human movement. 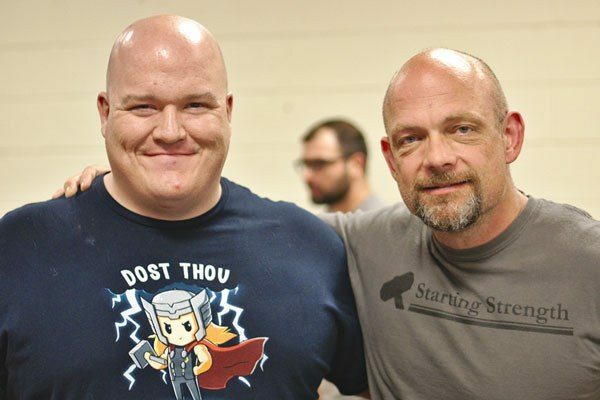 As a tool for coaches and lifters, it is unparalleled in this respect. However, the lone lifter often misses something in this translation. Processing a textual understanding of how a lift should look and feel, without external feedback, and executing it correctly carry some inherent challenges. Under the bar, the lifter’s senses are tuned toward the proprioceptive input created when one is trying to control the body in space. The lifter responds to changes in how the movement feels, developing a kinesthetic sense of the movement over time. The lifter may struggle to reconcile the understanding of a lift developed visually, through text, pictures, and video, with the proprioceptive input to which the lifter is required to respond and make adjustments while lifting. Without external feedback, the lifter may not know whether the movement he produces is correct or how to fix obvious mistakes. Even through video analysis, the lifter will not receive immediate feedback that would better develop a kinesthetic sense of the movement. These challenges are not insurmountable, but they may require a lot of extra work on the lifter’s part, translating different kinds of information into movement, usually forcing the lone lifter to “work on form” substantially longer and harder than a coached lifter. A good coach helps the lifter overcome the challenges of translating a model into movement. The coach and lifter share a common goal: Correct execution of the lift as defined by a model the coach knows and understands, which is achieved by the lifter’s accurate kinesthetic interpretation of the lift. The coach adds another perspective to the lifter’s efforts. 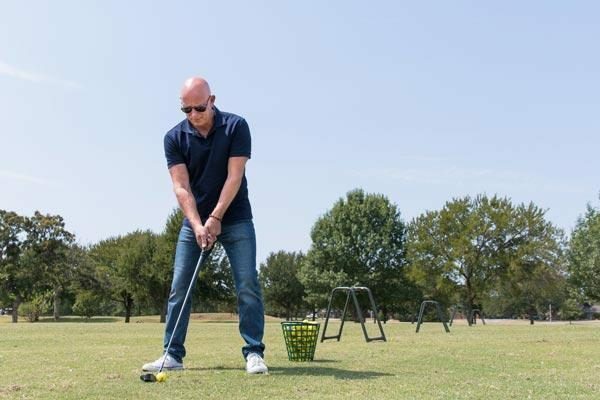 With a working understanding of the model for any given lift, the coach provides feedback, helping the lifter analyze the proprioceptive input of a lift and make adjustments. A good coach can fix individual quirks, adjust the lifter’s understanding of how each lift should feel, and help the lifter develop more consistent correctly executed lifts. The coach’s primary tool in this role is the coach’s cue. The coach’s cue is some form of communication that the coach employs during a lift, or part of a lift, that is designed to produce a physical response from the lifter, usually in the form of an adjustment or correction to the lifter’s movement. Cues take various forms. They tend to be mostly verbal, though visual and tactile cues are also effective when used correctly. Cues may be specific to the adjustment the coach desires (“Knees Out!”) or may be non-specific (“Now!”) and equally effective. 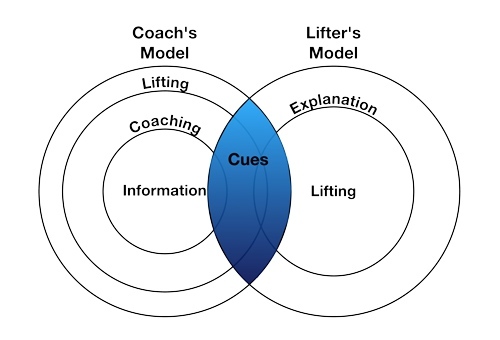 Ultimately, the form and efficacy of the coach’s cue depends upon the nature of the interaction between the coach and the unique lifter. The coach’s cue is fundamental to teaching loaded human movement, and becoming an effective coach requires that one consciously develop the skill of its use. The following is a theoretical outline for developing the use of the coach’s cue based on the nature of the communication between coach and lifter and their differing perspectives (i.e. the coach observing and analyzing, and the lifter lifting). This is something to consider for coaches or aspiring coaches who want to improve their performance on the platform. The purpose of this outline is to provide some insight into where coach’s cues come from, why, and how coaches might go about improving their own usage of them. The coach must consider the differing perspectives between himself and the lifter. The coach’s perspective is visual. The coach’s job is to adjust the lifter’s movement based on a generalized model applied with specificity to the individual lifter. The coach observes the lifter, interprets the lifter’s movements according to the model, and communicates instructions back to the lifter. The lifter’s perspective is more internal, based on feel. The lifter interprets the coach’s cues according to the feel of the movement and makes bodily adjustments, developing a kinesthetic sense of the correct movement. Accordingly, the cue is effective when it tends to cause the lifter to move closer to the model and minimizes other, undesired, responses. Cues that merely communicate the coach’s observations are not useful to the lifter, though they may be accurately descriptive of the problem. For example, telling the lifter who is first learning to squat, “you’re not deep enough,” has little chance of causing the desired correction, particularly if the coach recognizes the depth problem as caused by the lifter’s knee and toe angle (see Rippetoe and Bradford, Active Hip 2.0: The Director’s Cut, Jan 2010). The coach must communicate so that the lifter can understand the needed adjustment according to his awareness of his body-barbell system. The command “shove your knees out!” is the much more effective cue, because it is based on the coach’s understanding of the lift and communicates information relative to the lifter’s current proprioception. The coach must communicate the cue in a manner that accurately anticipates the lifter’s response. For the purpose of examining the coach’s cue, one can think of the interaction between the coach and lifter as a developing conversation, one where each person communicates in a different language toward a convergence of understanding. Using cues, the coach is attempting to impart a previously developed understanding of the model for a lift as it is applies to the individual lifter. The cue may be verbal, tactile, or visual, specific or non-specific. The lifter responds out of a developing sense of how the correctly executed model should feel, gradually acquiring a competence in the lift through movement. The forms that each person uses to communicate – various cues from the coach and movement from the lifter – come from two different perspectives of the lift: 1.) the coach’s visual observations, analyzed through the coach’s understanding of the model, and 2.) the lifter’s physical responses to the coach, analyzed and executed from the lifter’s “perspective” of being under the bar. The different perspectives of the coach and lifter, conceptually, are two different models for approaching any lift. The coach possesses an understanding of the model prior to engaging the lifter, a “coach’s model,” that encompasses everything the coach can draw upon to analyze the lifter’s efforts. In comparison, the lifter develops a “lifter’s model,” under the coach’s direction, comprising the lifter’s understanding of how the model for the correct lift applies to this lifter, personally, and a developing kinesthetic sense of the lift. Information. The coach acquires the technical knowledge necessary to build the theoretical aspects of the model. One can acquire information in many ways, but the individual should assimilate information around a specific model. Information, generally, draws from physics, mechanics, and anatomical and physiological bases. A good informational model will accommodate all lifters and, therefore, will lack some degree of specificity for the individual. Experience as a coach. Coaching provides primarily visual, but some tactile and auditory, input that the coach interprets according to a technical understanding of the model. This input further develops the coach’s model by adding movement patterns and different body types to the generalized informational understanding. Coaching requires the coach to apply the model with specificity. Experience as a lifter. Experience with lifting according to the model builds the coach’s own kinesthetic sense of the movement. Whereas coaching develops the model through primarily visual input, lifting helps the coach build the model through proprioceptive input. 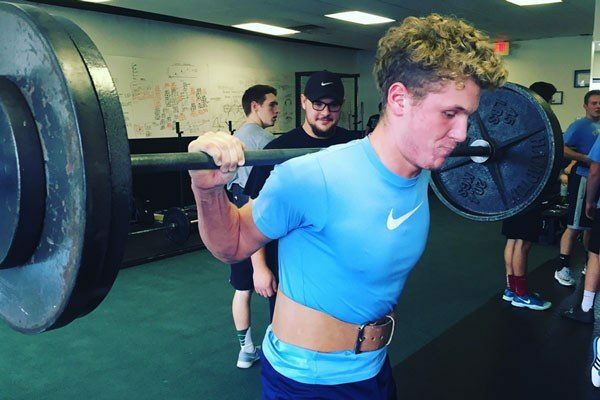 How the movement feels is the lifter’s “point of view.” The coach can communicate effectively to a lifter only with some understanding of what it is like to be under the bar. Otherwise, there will be very little overlap between what the lifter is experiencing under the bar and what the coach is attempting to communicate out of an incomplete understanding of the movement. Explanation. The lifter’s model is specific to the lifter and is developed partially through the coach’s explanation of how the general “coach’s model” will apply to the specific lifter. This explanation will be brief in comparison to the coach’s technical knowledge. The explanation is critical because the coach controls the information, and this is the information that the lifter will initially draw upon in response to cues. Note that some cues may be explanatory to the brand new lifter – a little longer and more specific or descriptive to what the lifter should be doing with his body or the bar – but an explanation of the lift is something that occurs before the lifter performs the movement. Experience as a lifter. Beyond explanation of the movement, the lifter’s model develops through experience as a lifter. Primarily, the lifter’s model is based on how correct (or incorrect) movement feels. This process is guided and developed by the coach, through the coach’s cue. The lifter interprets proprioceptive input, according to the explanation from the coach and the coach’s cues, continuously building the lifter’s model, through lifting. An information basis for the lifter’s model is not included here, because it is neither a prerequisite to lifting with a coach nor for effective coaching and cueing. Indeed, if a lifter absorbs information from many different sources, based on different models or theories of training, then this information may actually hinder the communication between the coach and lifter, initially. The overlap between the coach’s model, coming from three primary bases of development, and the lifter’s model, based on the coach’s explanation and the lifter’s sense of the movement, is the realm from which the coach’s cues are drawn. If the coach provides a poor explanation, then the lifter will not effectively be able to respond to cues. If the coach lacks experience as a lifter, the coach will not be able to cue the lifter from the lifter’s point of view of how it feels. In both instances, the coach will be ineffective and the lifter’s model will develop much more slowly. Effective cues come from the coach’s and lifter’s shared understanding of the lift, which is based on the coach’s explanation, the lifter’s development, and the coach’s own familiarity with the lifter’s perspective. Cues, then, serve a dual purpose. They remind the lifter to make certain adjustments with the body or bar, and they help develop the lifter’s model by providing feedback on the lift as determined by the coach’s visual analysis of the lifter’s movement. Cues change as the lifter develops a feel for the lift, becoming predominantly reminders as the need to develop the lifter’s kinesthetic sense diminishes. The coach’s discretion is when and how to use cues and what form they take, built on the coach and lifter’s developing rapport the lifter’s progress. The limited use of tactile cues provides an example of how the coach might exercise this judgment. The lifter’s perspective is primarily one of feel, making tactile cues very useful to establish important aspects of the model efficiently. Tactile cues are powerful tools that narrow the lifter’s focus to a particular aspect of the body or movement. The lifter’s model comprises the entire kinesthetic sense of the movement, and tactile cues tend to narrow the lifter’s focus. Accordingly, tactile cues are used early on to establish important aspects of the lifter’s model or during lighter weight sets as curative of specific problems, but are less common in later stages of working with a lifter or during work sets. For example, the concept of hip drive in the squat cannot be coached as effectively verbally as it can by placing one’s hand on the lifter’s sacrum and having the lifter drive up against it. This establishes hip drive by drawing all the lifter’s attention to the hips and producing a movement that the lifter can feel and, therefore, more easily repeat. This tactile cue is most effective very early in the learning stages of the squat to help the lifter develop his kinesthetic sense of hip drive, but it would distract the lifter at heavier weights when the lifter’s ability to heed external stimuli is diminished. Drawing the lifter’s attention to a single area in this way detracts from the lifter’s sense of the movement as a whole and, therefore, should not be repeated at heavy working sets, but it is very effective to train the lifter’s kinesthetic sense of hip drive. Later, the coach can bark less-specific cues to remind the lifter of the movement (e.g. “Drive it up!” or “Drive!”). This well-established method for teaching hip drive highlights the concept that the coach’s cues are more effective when they consider the development of the lifter’s model and the coach’s experience of what it feels like to be under the bar. 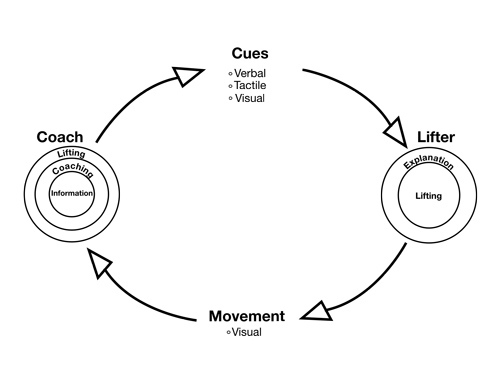 Similarly, this framework for thinking about the cue shows why the coach will change the form of the cue over time and prioritize cues according to the concept of an expanding lifter’s model. The coach brings an already well-developed understanding of the model to the conversation with the new lifter. The lifter’s understanding of the model and ability to execute it will develop during the initial learning phase and beyond. This affects how the coach should use the cue. The progression of the coach’s cues from more specific, explanatory cues to single word reminders mirrors the lifter’s development. Cues in the initial learning phase are usually specific to something the lifter should do with his body or the bar, but do not detail the abstract model for the lift. Any explanations should focus on the information necessary for the lifter to perform the movement. The deadlift set-up is a good example of cues that are specific and somewhat explanatory, but not unnecessarily detailed as to the mechanics of the lift (e.g. “bring shins forward to touch bar”; “knees out into elbows”; “squeeze the chest up”; “don’t drop your hips!”). In this early phase, it is the coach’s job to make sure that the lifter’s proprioceptive input adjusts to align with the coach’s informational model. This process develops the lifter’s feel for the model. Clear, effective cues in this phase of coaching allow the cues to get shorter, because the lifter will have a better-developed model and the coach will know the lifter’s level of competence in the movement. Effectively developing the lifter’s model also means the coach needs to prioritize cues. A lifter needs to establish bigger, more important components of a lift first, since these will be the biggest parts of the lifter’s model. Whereas, important but less crucial adjustments can usually wait until the lifter can devote less conscious effort to the lifts’ fundamental components. Having prioritized the most important aspects of the lift, these bigger issues can be adjusted subsequently with brevity, and greater consistency in these key areas of the model will result. Cues need to become short, because as the lifter builds his model, he needs to focus more on his own body in space and less on external stimuli. For example, if the coach prioritized the knees tracking out parallel with the toes early on, then as the weight progresses, yelling “knees out!” can elicit an almost instinctual response in the lifter without diverting his attention. The efficacy of short, direct cues depends upon the coach’s ability to build the lifter’s model well in the early stages. These are a few select examples meant to demonstrate the value in thinking about the coach’s cue as involving separate coach’s and lifter’s models that affect how the coach will teach a lift. This approach suggests improving one’s performance as a coach though study, personal experience with lifting, and experience with coaching. These areas are fairly easy to pursue for the determined individual. Also, for the coach who wants to develop a basic understanding of the cue from which to approach the teaching method of any of the lifts, this cueing archetype suggests one consider how the lifter’s model will most effectively develop over time and apply the appropriate cues accordingly. Nothing trumps a deep understanding of the model, when it comes to coaching effectively and using the coach’s cue. This includes an information-based understanding and experience as both a lifter and a coach. Developing these areas will provide a solid basis to improve as a coach. Brevity. Even relatively long cues should be brief. The coach should avoid diluting the cue with extra, unnecessary information. Also, the coach should be aware that some of the positions the lifter will assume are uncomfortable, and may cause fatigue if the lifter is made to hold them while the coach presents a thesis statement on the use of the hips in the press, for example. Saturating the lifter with information may be interesting, but it is not helpful to performing the lift or developing a good sense of it. Volume. The coach should be loud and clear. The lifter should not have any cause to play “telephone” with the coach’s cues. Yelling, “KNEES OUT!” will force the lifter’s knees out; mumbling, “knees . . .” might have some interesting effects on the lifter’s back angle. A loud, clear cue is much more likely to cause the lifter to respond as anticipated. Repertoire. The coach should build his repertoire of cues. Cues affect lifters differently. If the lifter does not respond to a cue as the coach expects, rather than explaining the cue and what it means, the coach should be able to adjust the cue itself. Rarely does a coach have only a single shot at correcting a lifter, and being able to cue something in different ways is a basic skill that will improve communication. Cueing is a way to help the lifter develop a correct sense of any lift by taking its mechanics, physics, and biological details and helping the lifter translate that information into a consistent, repeatable kinesthetic sense of the correct movement. Coaches should constantly study, every coach should lift, and importantly, coaches must coach. The coach gains new depth and insight on all other information and experience by applying the coach’s model with specificity to each unique lifter. The coach’s cue is an important tool, but if it lacks the substance or purpose, of a well-defined coach’s model or for developing the lifter’s model, respectively, then cues become little more than the coach’s wasted breath and the lifter’s wasted time and money.